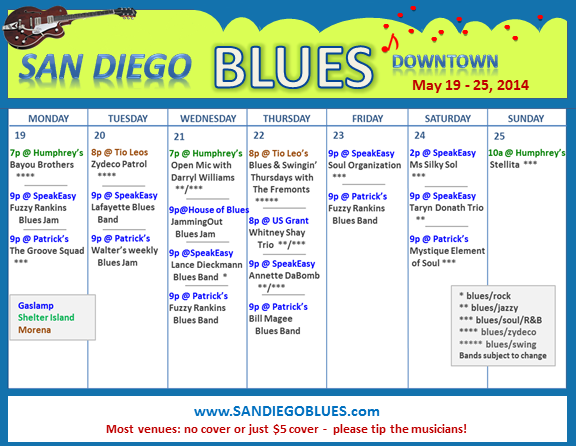 Monday through Thursday this week, we have lots of San Diego blues to choose from. It is lite over the weekend, which isn’t unusual downtown. But Patrick’s, which usually has some blues, will be mostly rock so they aren’t on the schedule for Friday or Sunday. 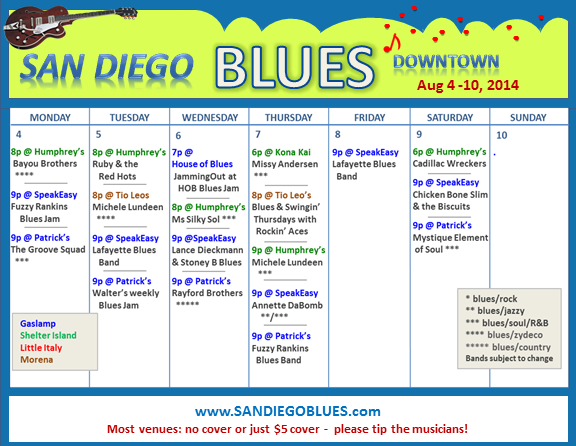 Humphrey’s on the other hand has lots of blues this week, and on Wednesday evening some powerful R&B/blues with Ms Silky Sol, who is new to the San Diego scene from St. Louis (where she has a great following). She is a raw, tell-it-like-it-is powerhouse with an incredible voice. Go check her out! This week we have a nice mix of blues – from straight up blues to blues mixed in with zydeco, swing, jazz, R&B and soul. Silky Sol is new in town – from St. Louis, and she has an amazing soul voice (think Aretha Franklin). You can catch her Saturday afternoon at the SpeakEasy from 2-5pm. Jams are happening as usual on Monday (Gaslamp SpeakEasy), Tuesday (Patrick’s Pub) and Wednesday (JammingOut at House of Blues AND also at Humphrey’s), so there are two jams now happening regularly on Wednesday nights. NOTE: JammingOut at HOB on Wednesday will start at 9pm, not 7pm – this week only. Every Tuesday night Lafayette Falkquay and his blues band plays at the Gaslamp SpeakEasy. On drums is Billy Wear and on bass is Ronnie Baumslater. This Tuesday he was also joined by harmonica player, Doug Camphuis (who played with Lafayette a number of years ago), doing one of Lafayette’s signature cover songs… Black Cat Bone. A former drummer also stopped in to play with the band, Frank Alverez, and here he is playing with other friends who came in that night: Fuzzy Rankins on guitar and Ms Silky Sol (Red Afro Queen) as they perform cover song Rock Me Baby. And later on Ronnie took over the mike to sing Skin Tight. Not exactly blues, but rounded out the evening perfectly.